Often we need to unit test code with side-effects that interact with other parts of your system using abstraction — protocols in Swift. There are many techniques to build that abstraction and verify if our code works as expected: stubbing, spying, dummying etc. Previously, I made a deep dive into auto-generating a stub placeholder that allows seamless customization of a mock’s function behavior right in a test case. Let’s extend that approach with a spy registration that observes and records side-effects generated during a test case. Let me present in a nutshell how you can speed up a process of building function’s stub with some Swift compiler help (for details refer to my previous post). The benefit is that we don’t have to manually specify the type of addUserAction variable. However, generating its body (addUserAction) has to be done on a test case-level which often leads to messy variable declaration and assignments as above. The aim of this article is to completely eliminate that manual step of action declaration which in a first place can positively affect test case readability and as a by-product positively affect development speed and joy. Although we have a simple way to define stub, we completely ignore passed arguments there. However, it not uncommon to inspect arguments that have been passed to the mock object and to achieve that we need to apply another trick. Thanks that body of a mock’s function (like addUserAction) is defined as a variable we can easily edit its behavior in a testcase runtime. 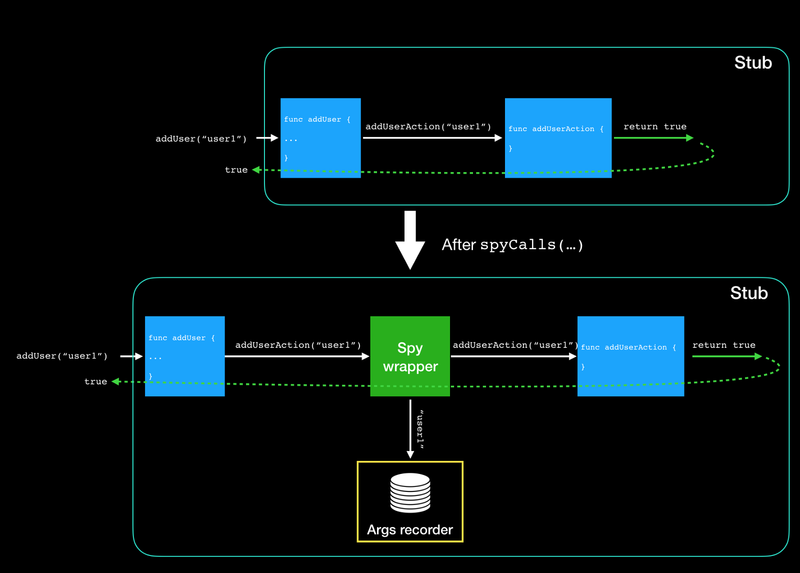 To apply a spy, just inject an intermediate spy layer that stores all the arguments call in a recorder and performs already specified body. If you are not familiar with Swiftinout modifier, it gives a change to modify the value of passed argument once it is finished. It resembles a bit passing pointer argument in Objective-C but with a restriction that it cannot escape that “pointer”. spyCalls takes an inout argument of a function to spy, injects a function that records its arguments to ArgRecords<I> and then calls original stub implementation. Implementation of a missing ArgRecords is really straight-forward as this is just a custom collection to keep track of all records. It needs to be represented as a reference type collection and backing up by the simplest Array is often enough (as long as you don’t expect any multithread read/write operations). Technically, subscript could return non-optional T and conform to Collection but any out-of-range access crashes the test suit —it is up to you what type to select. If you find it useful and promising, this is just a beginning! The presented approach sets up a foundation for much more complexed and omnipotent testing toolset that supports synchronous or asynchronous expectations, return values control with some syntactic sugar API. Open-source StubKit library is based on that approach and provides a set of extensions (some of them are described below). However, if a single generic type for a stub is unacceptable, you should prepare a set of expecting specializations and choose one that matches. Please refer to StubKit’s documentation for detailed example. I believe that the presented in this article approach eliminates some degree of dummy code that has to be written, although some minimal work to prepare a mock/stub is still required. The greatest benefit is concise and self-explanatory test case without a flood of intermediate variables placed around stubs and test case scope.